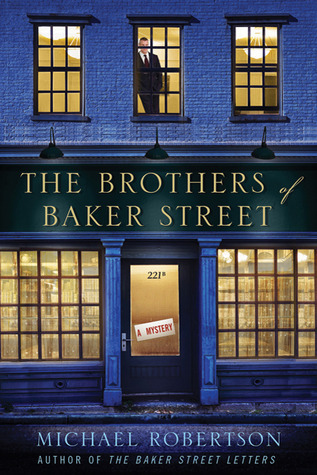 The Brothers of Baker Street is the second in the series about 2 brothers who rent law offices at 221B Barker street. They receive letters almost daily written to Sherlock Holmes. Part of their lease agreement says that they must answer the letters with a form letter and nothing else. In the last book, answering one of the letters gets the brothers in all sorts of trouble. This time around, a descendant of Professor Moriarty is up to no good. 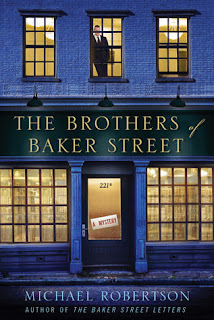 I liked this one a lot more than the first one (The Baker Street Letters) . There was more of both brothers in this one whereas the first one was mostly from Reggie's point of view. I thought the mystery was pretty good. I liked the twists and turns that it took. There were also a couple of red herrings which I liked. The author delves more into the brothers' background this time around as well. I really liked both of them and think that they make a great detective team. The one thing that was frustrating was that Reggie never tells Laura how he feels about her. Like the first one, this one wraps up the mystery, yet ends in a sort of cliffhanger. I hope there is another one coming soon. If you haven't read The Baker Street Letters, I would pick that one up before this one. If I had read this one first, I think I would have been a bit lost. The author makes references to the first book that I think could get lost on the reader. I listened to the audiobook. Simon Vance was the narrator and I love his voice. I definitely recommend both books, especially this one. This is a great, quirky series! I love Sherlock Holmes so this one sounds right up my alley. Thanks for the awesome review.